Venice is one of the most romantic cities in the world. If you are to spend your honeymoon, or even just a vacation there with your loved ones, you should consider yourself very lucky! Here are some of the activities that you can do with your romantic partner- let us know if you have any recommendations in the comments below! While a Gondola ride may sound like a very touristy thing to do in Venice, it is still inevitably one of the most romantic things that you can do with your partner and definitely something to tick off the bucket list. Breeze down the river and enjoy the sights in this two-person romantic capsule. One of the more popular paths to take is the route from Barcino Orseolo, through the more scenic smaller waterways and then arriving at the Grand Canal. Be sure to catch the sunset in Venice if you are there for a romantic getaway. The golden hues of the sunset can transform Venice into a perfect backdrop for a proposal, an early dinner or just a cuddling sesson with your other half. Catch the sunset from Giardini Pubblici in Castello ot from the park at Sant'Elena. Even better, kill two birds with one stone by watching the sunset while on your gondola ride. Stroll along the Lagoon or wander along the streets or piazzas in the evening after the crowd has receded. The night will transform Venice into a magical kingdom. The shimmering reflection of light from the water, music playing from Piazza San Marco and the tranquil atmosphere are the reasons why Venice is one of the most romantic cities in the world. 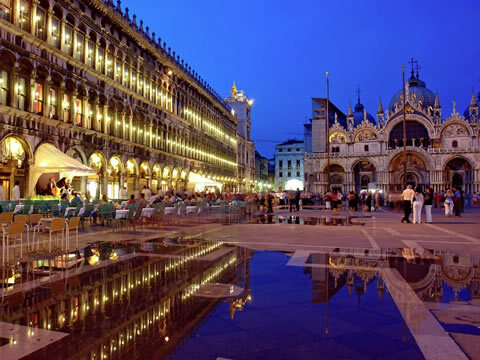 Waltz or slow dance to the music at Piazza San Marco by the river to end your night. Venice is a city full of stories, histories and legends. This stone heart is a result of an old Venetian love story between a fisherman and a mermaid whom he caught during one of his fishing trips. The two fell in love, got married and had three kids. However, the mermaid was cursed and would turn into a viscious sea serpent once every week. She died but rose from the dead and still returned everyday to clean and cook for her husband. However, not knowing that the sea serpent was his wife, he killed her. The stone heart is a symbol of their eternal love at their love nest. Couples come here to touch the stone in hopes of blessings for eternal love whereas singles come here to find the love of their life. Nothing kills the romance more than a crowded restaurant filled with buzzing tourists. You will feel like you are sharing your special moment with a hundred outsiders. Even worse, you might be asked to share a table with someone else. This will not happen if you have a dining experience with Walter at his private rooftop. 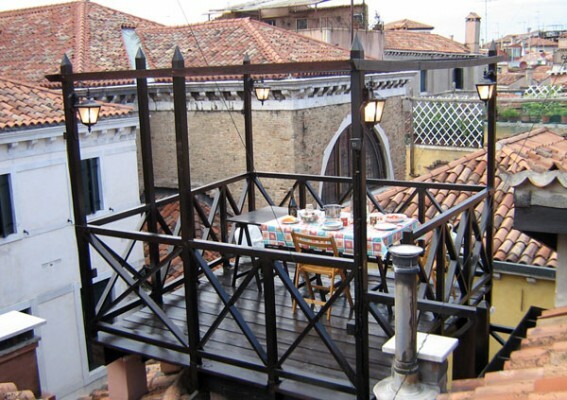 As a professional chef, the dishes prepared by him display the long and rich history of Venice. You can have the choice of customizing your menu as he will prepare dishes based on what is fresh in the market. Do tell him that you want a romantic experience and he will decorate accordingly.